Poitiers is rearranging the river banks of the city. The project began in 2013 and various projects have been carried out. This time it's the turn of the "Clain-Bajon" car park to be renovated. A pontoon and a pedestrian way have already been installed. 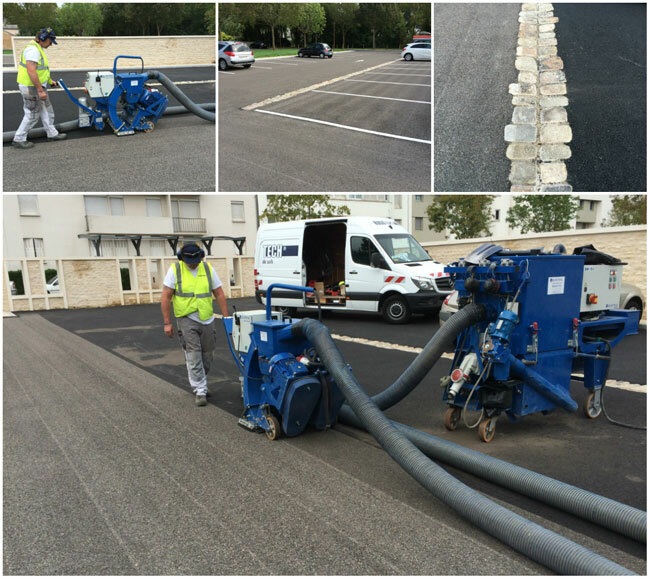 Our customer Rugotech, European leader in surface preparation and road regeneration, responded to the city of Poitiers who wished to give a particular effect to the car park coating, and the shot blasting technique was selected. Shot blasting the surface allows you to remove the floors top layer and to bring out the mineral color of the stones. It is an environmentally-friendly technology because it doesn't use any chemicals or water and the dust and debris are automatically collected and packed thanks to a powerful dust collector. People from Poitiers will enjoy the nice views of the river banks in a clean and green environment.